Úgy tűnik, mintha a tárcsák kissé szűkek lennének a dobozban, vagy a szalag rosszul hengerelt. Úgy tűnik, hogy az információ jól rögzített, de a sebesség nem tartható fenn. It seems as if the reels were somewhat tight in the box, or the tape badly rolled. The information seems to be well recorded, but the speed is not maintained. I wonder if it can be put on a machine code library or an engine, then it will be more usable. This adapter has taken me less time, I had the PCB and connectors made the day before yesterday. I had luck with the leads yesterday, whitout errors and only some pull-ups. I've just received the SF3 for CPC. It is an earlier version, without WIFi and MP3, but good to interface and test on the Enterprise. New function added to the SE-ONE. A number of sample files can be defined to sound when an event is triggered, like a key or joystick movement. This Basic example program shows how a key can be associated to a MP3 file. When the same event is found the execution is stopped and started again. Once defined the file name, the sample is launched with only three OUTs: "OUT 38,0: OUT 39,N: OUT 38,128"
The samples must be placed on the SAMPLE directory at the root of the pen-drive. Good idea, but the jumpers marked as SRAM/FlashROM only, to avoid confusions. Történelem / Re: Mit szerettek a legjobban az Enterprise-ban? Amit a legjobban szeretem az Enterprise-ról, az a szlogen: "With obsolescence built out"("Az elavulás nélkül épült"), ami inkább az egész projekt előfeltétele. Ennek alapján a hardvert és a szoftvert "örökre" bővíthetővé tették. Nem itt az ideje a történelem felülvizsgálatára, de abban az időben vagyunk, amikor - bár egyre kevésbé - látjuk a megközelítés helyességét. Most, hogy tanúi vagyunk a hardveres és a szoftveres tényeknek, amelyek biztosan elképzelhetetlenek voltak még azok számára is, akik az Enterprise-ot tervezték. What I like most about the Enterprise is its slogan: "With obsolescence built out", which was rather the premise of the whole project. Based on this, the hardware and software was created as "eternally" expandable. Now that you have some experience with memory expansions, you (with your friend) can try to make a simple SRAM/Flash ROM card for the expansion bus. The first 74ALS138 is totally the same as the External Cartridge Bay. Then you can directly connect 512K chips to the 138 outputs, like my first Flash ROM card. Input D0-D7: any output from the LS138. 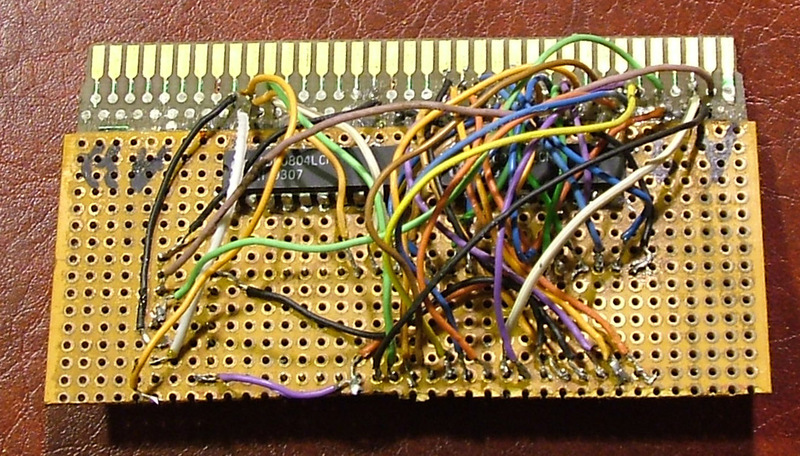 Each Input represent a 64KB area of the memory chip, that will be enabled in the selected 512KB area. For example D0:Y2, D1:Y0, D2-D7:Y2, then the ROM chip will be at: 40h-43h, 04h-07h, 48h-5Fh. The second 64KB is moved to cartridge area, then you can install there the quick memory test for EXOS 2.0/2.1 (on a machine with original ROM), when no cartridge is used. For a card I suggest to place a 7805 with a jumper to select or not +5V from bus Pin4A/B. Then the card could be also used with a soldered edge connector to plug directly to the machine. This will be a good alternative to the internal memory expansions, for who doesn't want to open the machine. On the screen you can see a dull MSX app from the 90s era to test the files. This was 2 years ago, now the SE-ONE has been integrated on the SymbiFace3 for CPC, ready for its release probably before the summer. But the development is not on idle on the other 3 computers that support SymbOS. Soon I will be gifted by Hans with a SymbiFace3(CPC) to make the first tests of connection to an Enterprise. Only I/O, because the memory pagination systems of the two computers are very different. I have said 4 computers supported by SymbOS, don't forget the Amstrad PCW or Schneider Joyce, a CP/M native machine that was widely sold on the 8 bit era mainly as a text processor. The guru of the PCW is Habi, a spanish friend, the guy who created a colour input for Enterprise in only an hour.... Not the first, that was Balaguesz. As you know, Prodatron pursues the hardware convergence of the four computers. It happened that Prodatron knew about Habi, but didn't have a contact from him. Then I asked Habi if he wanted to join the SimbiFace development group, and he acceded. 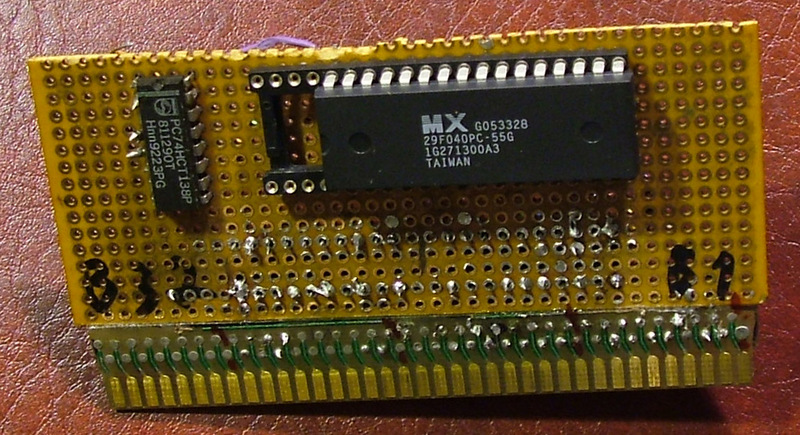 Habi has already designed a MSX slot adapter for the PCW as a first step. I will aid him to beta-test it. This is a V9990 SymbOS running from the external cartridge bay. Still a bit dull, because I had no time to search a desktop background picture for it. Sorry, this is the normal 4 colour SymbOS Nick mode, but tomorrow I can take for you a picture or video of the new V9990 SymbOS mode. Perdón, esta foto muestra el modo normal de SymbOS a 4 colores de Nick, pero mañana puedo traerte una foto o video del nuevo modo V9990 de SymbOS. I have tested your mouse2.com and mouse3.com programs. The two fail on 10MHz. You have to reassure that the interrupt is made every 1/50 second, because these routines work on other programs on my 10MHz Enterprise without adjusting delays. A lot of tests where made when developing the EnterMice to achieve it. I will read your code to try find the cause. Page created in 0.114 seconds with 36 queries.